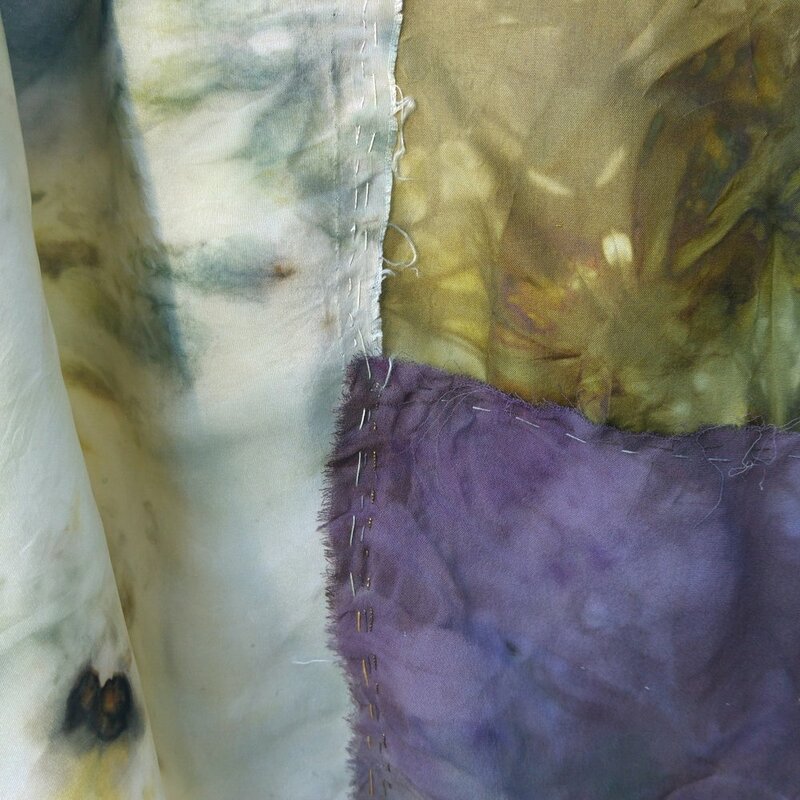 Naturally dyed silk, hand-stitched show piece by slow creations. 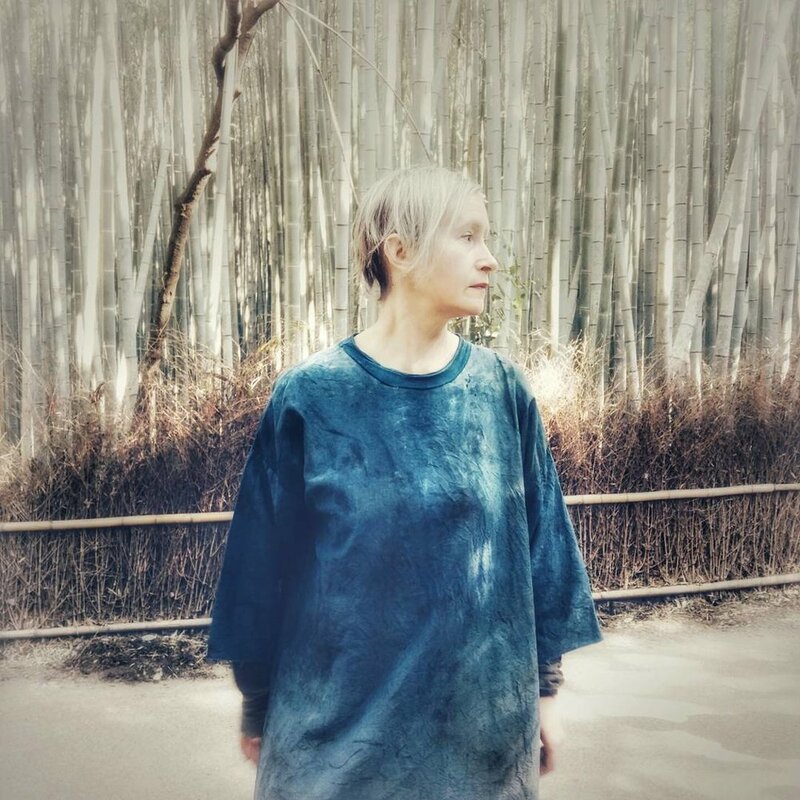 Photo taken at Arashiyama bamboo forest in Kyoto by G.
Handmade ±Easy Piece from silk fabric dyed in Sweden in 2014 by slow creations a.k.a. 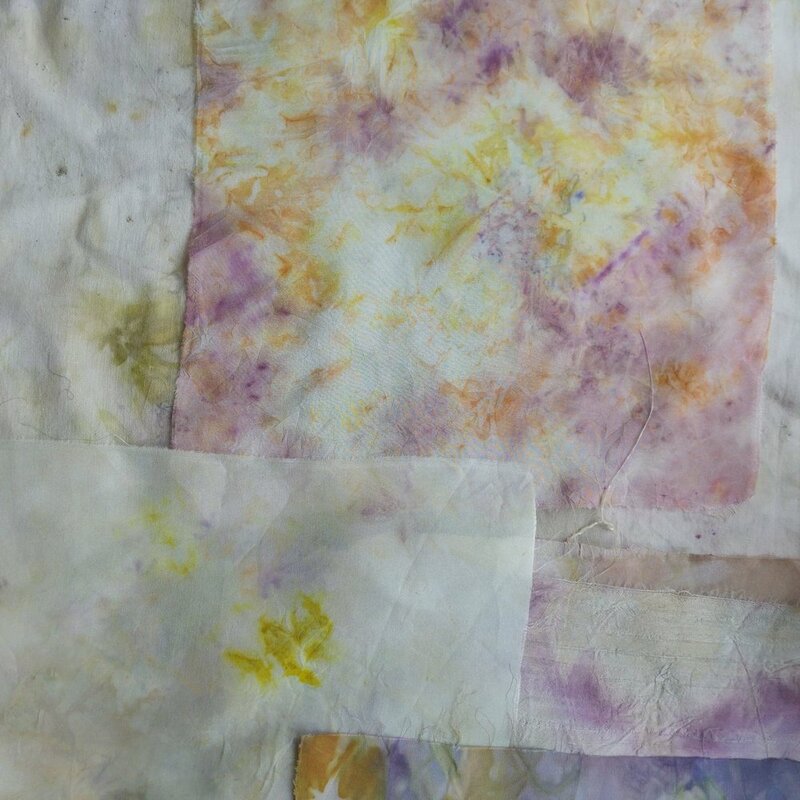 Petra Holmberg with avocado skins plus rust, re-dyed in Okazaki area at atshikari with japanese indigo aizome in 2017. 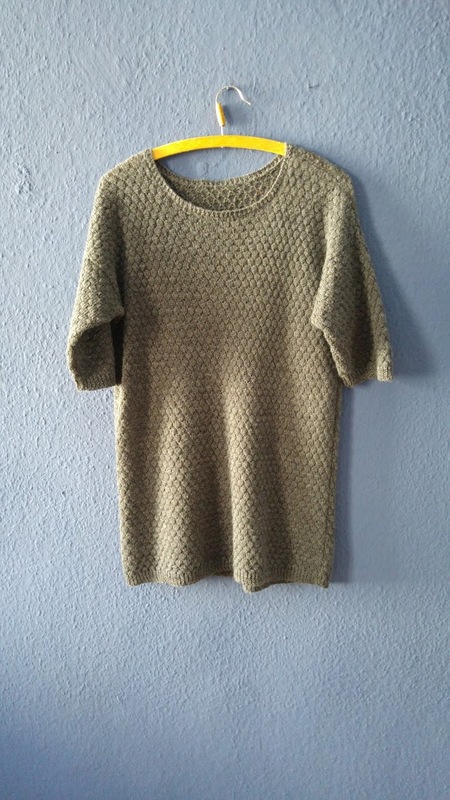 ±Easy Piece bubble knit by Lene Madsen / Leluma Design created on a hand knitting machine. 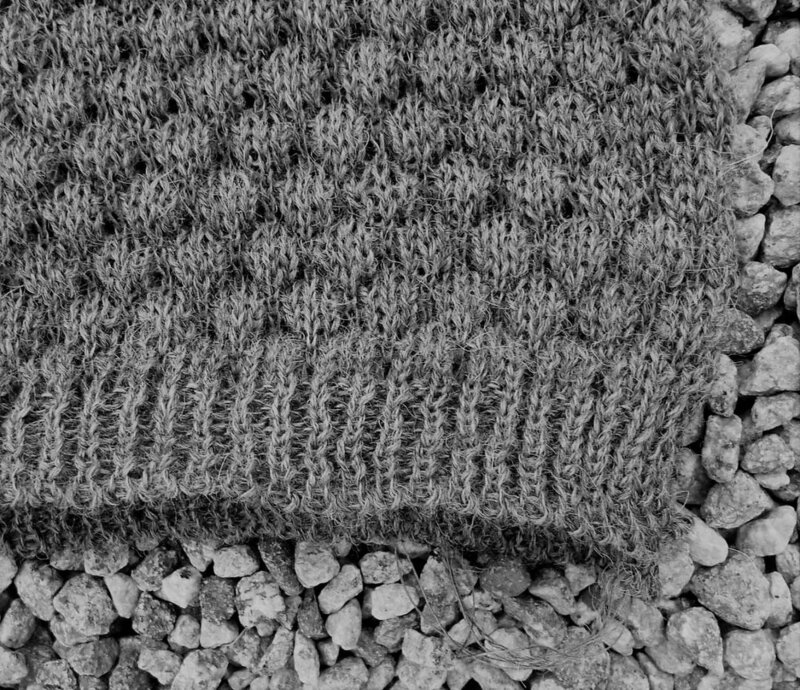 Naturally gray alpaca wool from Peru and organic linen from Bockens lin in Hälsingland, Sweden. Originally intended for Runa Juhanisdotter’s test collection wardrobe. The piece shrank two sizes after washing and is now part of the show case exhibition. Size M-L, based on pattern 1.0. 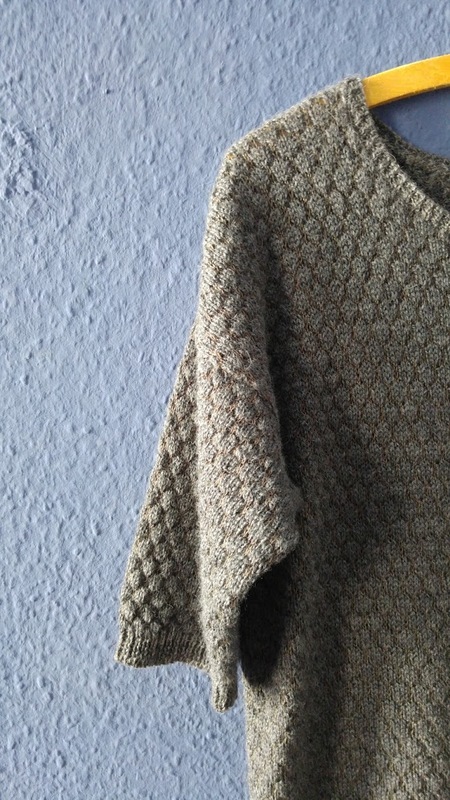 The ‘Birch’ jacquard pattern for handknitting machine, designed by Lene, is here used with a technique called punch lace, using a thicker linen yarn from Växbo Lin, in combination with a thinner yarn of organic cotton from Ekelunds Väveri. Both yarns are rest batches sourced at their weaving mills. Beautiful, quality yarns and good waste management. Check out the different look and structure between the two-colored jacquard from Leluma Design’s regular collection and the mono-colored punch lace Easy Piece. The choice of a different technique and two different yarn types creates an interesting, sometimes transparent structure and the birch pattern is no longer as prominent. 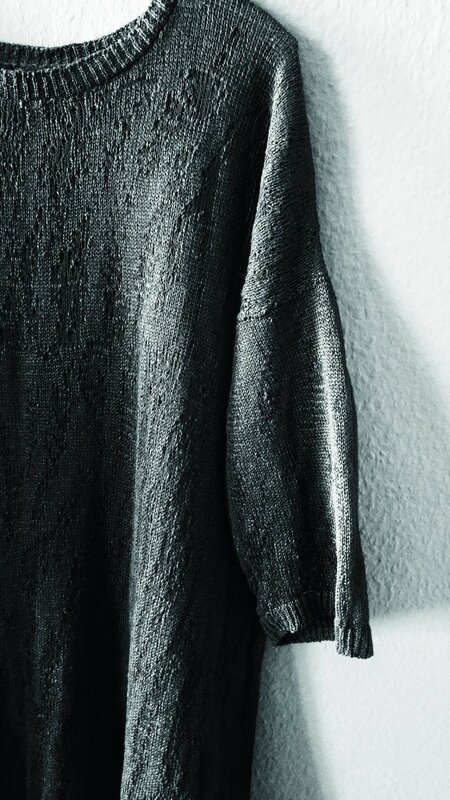 ±Easy Piece by slow creations a.k.a Petra Holmberg for Runa Juhanisdotter. Beautifully photographed by Ela Roth, in the fields outside Ela’s hometown, south of Berlin and in Santa Elena, Honduras. Process close ups photographed by slow creations. All rights reserved. 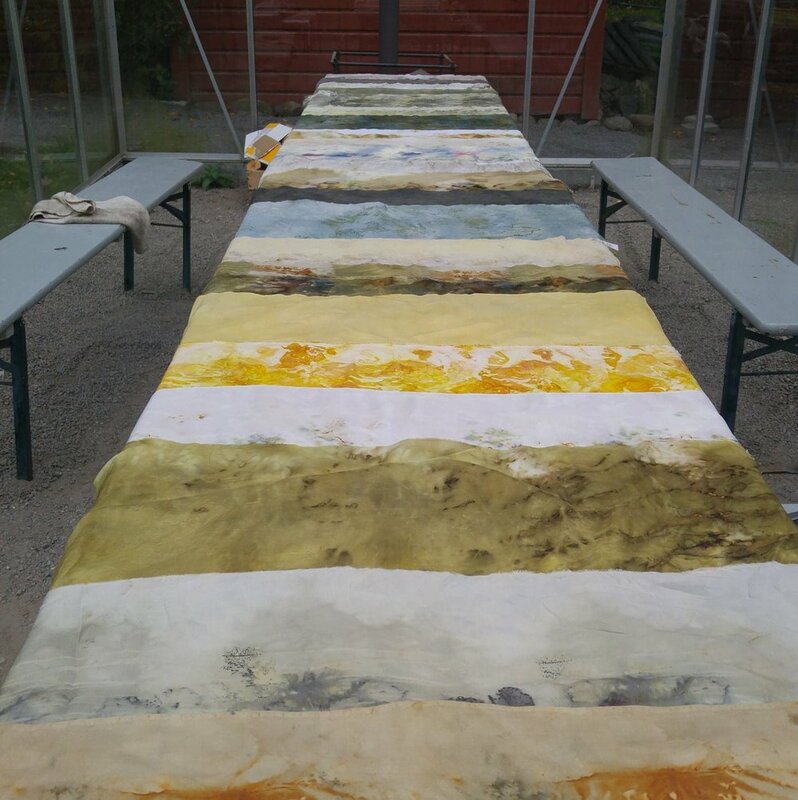 Runa proudly inaugurated this cool Easy Piece on July 19, 2017, at Textilstammtisch ‘Scandinavia’ at Sourcebook in Berlin, where she was invited to speak about what’s up in the north. The pig in the picture is called ‘Muñeco’ - ‘Doll’. 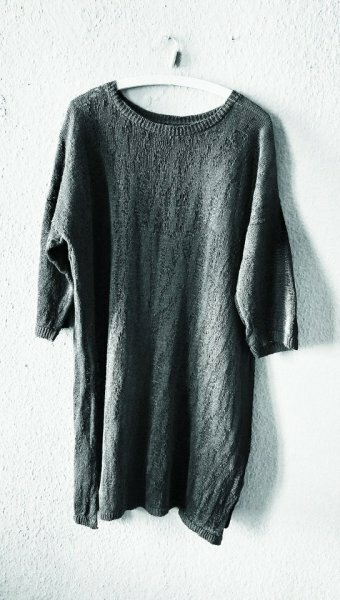 “We (Runa and I) decided on a coarse, but at the same time somewhat loosely woven, silk fabric that looks more like a linen fabric, with the advantages from silk (warmth, breathable comfort) with a rough, “street” feeling and look, not delicate or ladylike as I thought that would not be in pair with what I associate with Runa… The sleeves are of a silk fabric that is thin and matte, more suitable for these parts of the garment, for the need to move easily and comfortably. The fabric is thus new, bought from England and a store in Stockholm, but everything else, such as the dyeing stuff, is reused, i.e waste such as too old blueberries, red onion skins, twigs of fir tree, avocado pits and last, but not least, rusty things I found, such as a bike chain incidentally found in my backyard in the middle of Stockholm just before I started to dye this Easy Piece. 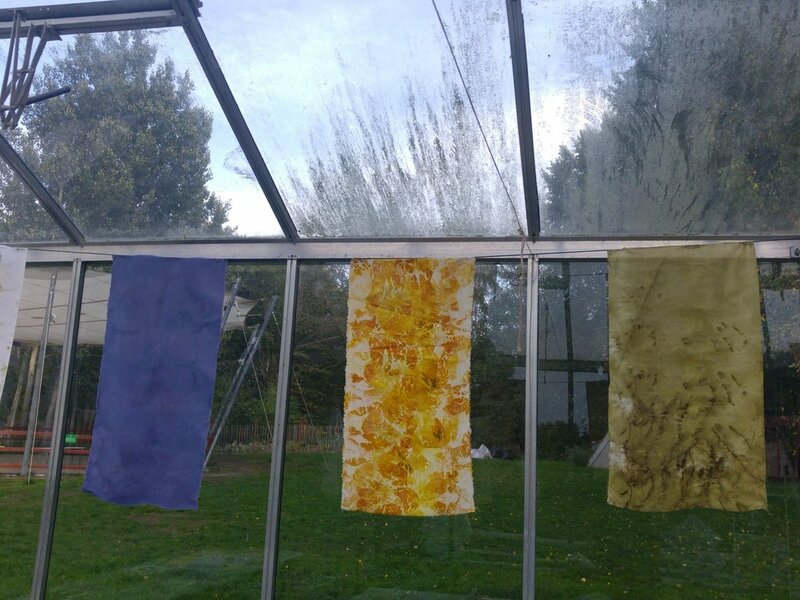 So first you eat (most of) your berries, your onions or avocados, find an old Christmas tree lying around, rusty things and then you dye! The wish from Runa was to have these ingredients and then I made it, seeking my way through the process. 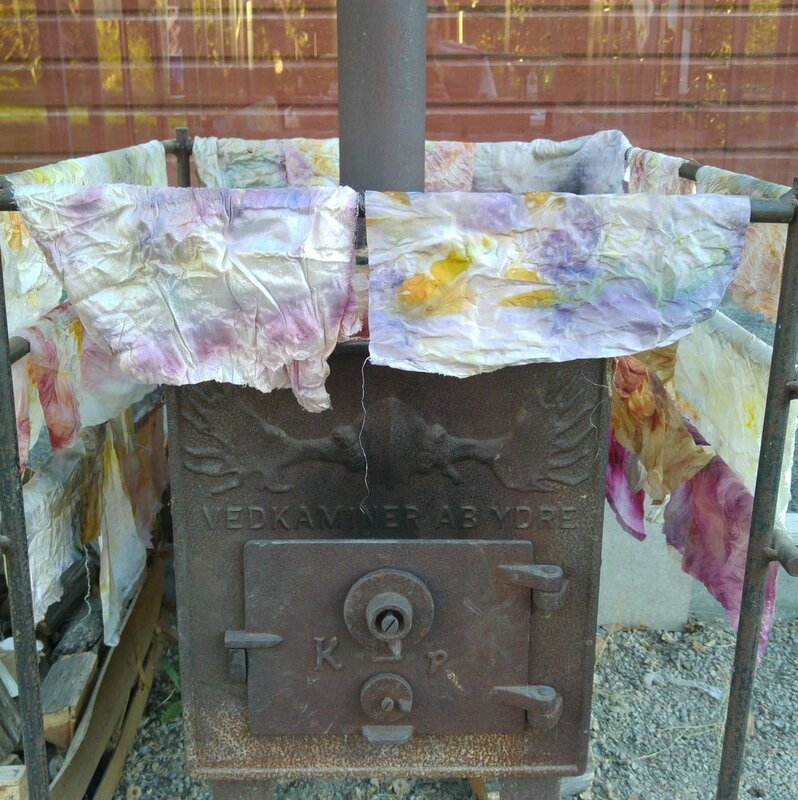 At first, neither Runa nor I, were satisfied with the sleeves (they were in a dull greenish tone dyed from onion skins together with rust), so I re-dyed them with blueberries, black tea and rust. They ended up more monochrome, a calm contrast to the more lively or dramatic back and front parts. It was a challenge to not make the main parts too even, but contrasting between lighter and darker areas. 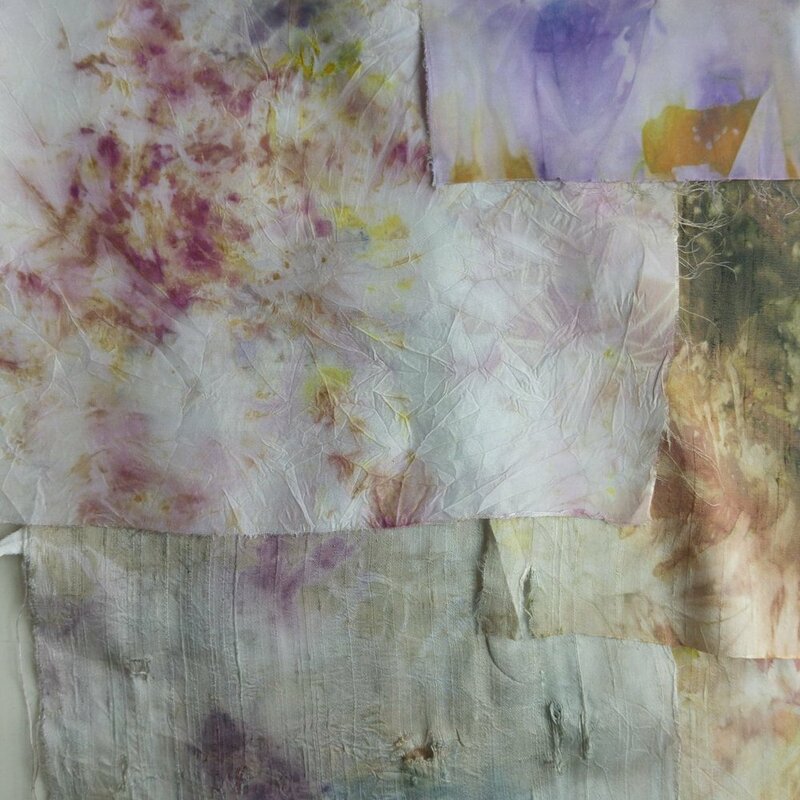 As it is not possible to totally control the natural dyeing process, you have to trust your knowledge, let time go by (at least two days and nights to dye) and also wish for a good outcome . The sleeve hems were later adjusted to make them longer and hand-stitched by Runas mother, who also stitched the neck lining. Design by Albena Stateva, Bennelle. Woven on a DIY loom. Cotton t-shirt / rug yarn. 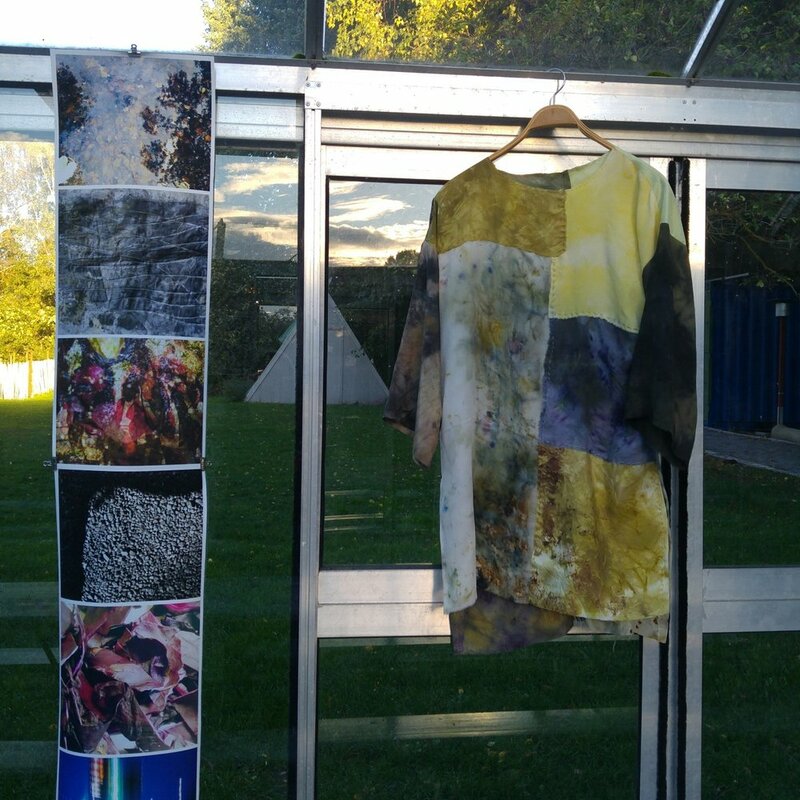 In the pictures above 1) Albena is finishing the ±Easy Piece at OSCEdays Berlin, 2) work inn progress at Bennelle’s studio, and 3) Hannah Schorch wearing the weave n’ knot ±Easy Piece by Bennelle and Albena wearing an ±Easy Piece raincoat hack by Hannah, erie berlin. On September 22, 2018 slow creations opened her first solo exhibition - Place. Time. Colours. 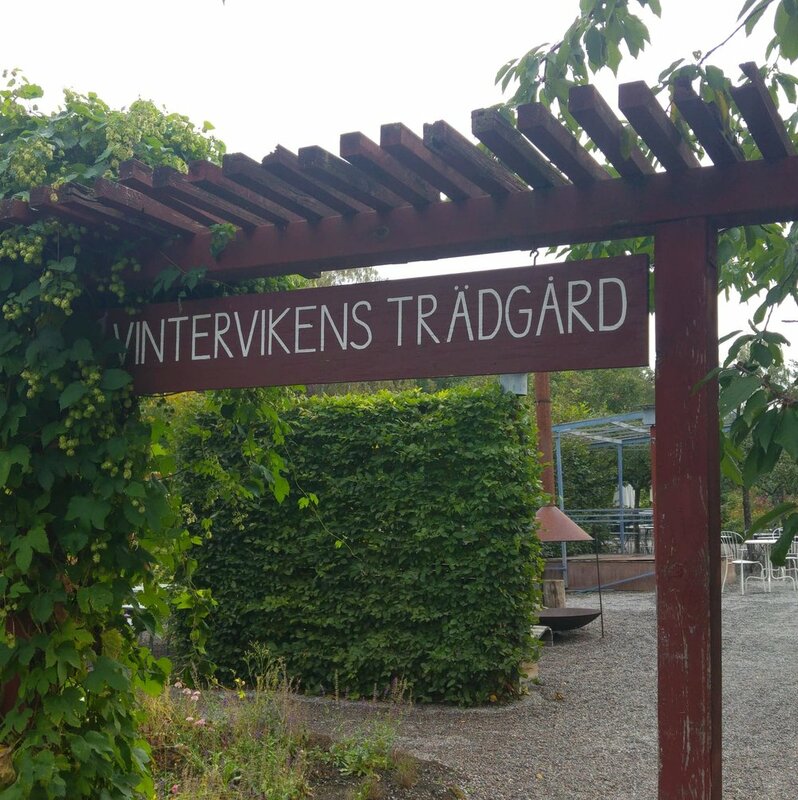 - at Vintervikens trädgård in Stockholm, Sweden. 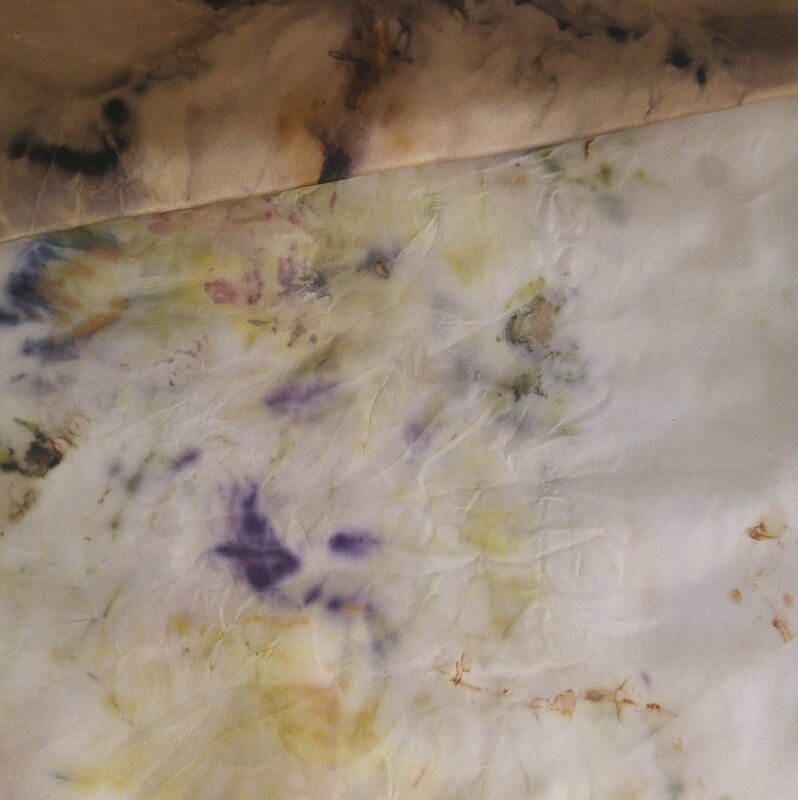 With this textile art show she investigates what stuff for natural textile dyes are found in our surroundings. 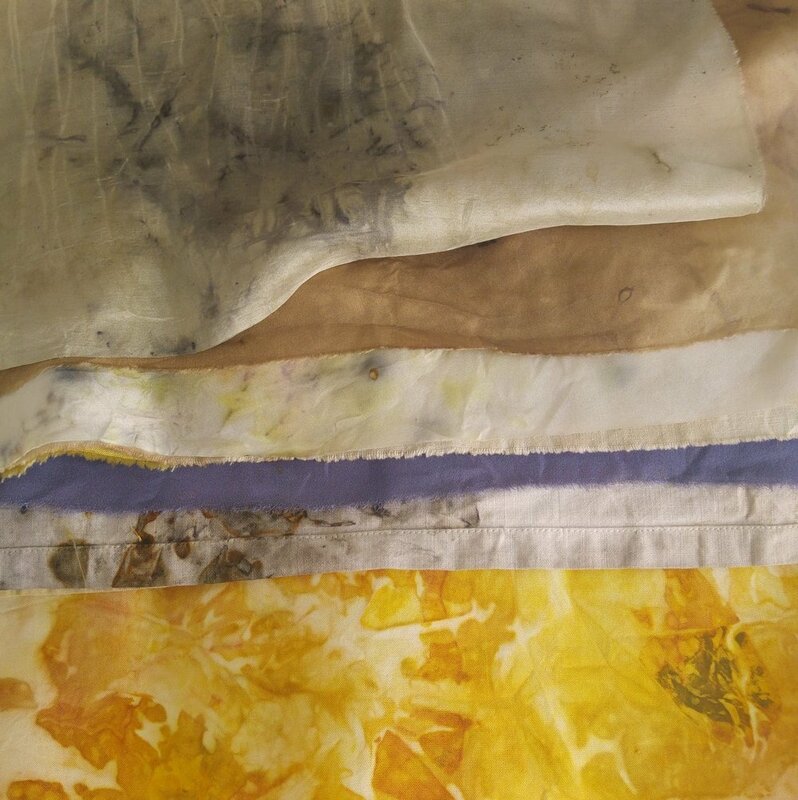 By paying attention to and taking advantage of what’s close, she wants to practically and poetically explore the possibility of dyeing textiles naturally and environmentally friendly. In the exhibition was this beautiful ±Easy SHOW Piece above. 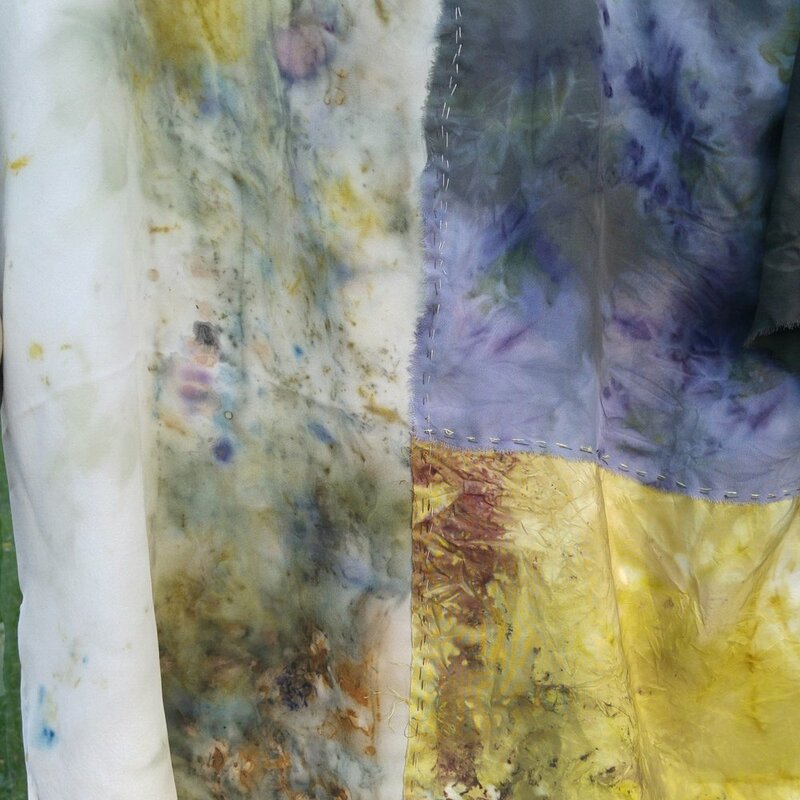 Dyed and sewn by hand. Based on pattern 1.0.